The Doomsday Clock, a simplistic concept created by a posse of guilt-riddled scientists, now allows just three minutes until midnight and the end of the world as we know it. The apocalyptic clock first appeared on the cover of the 1947 Bulletin of the Atomic Scientists, established by men who regretted their role in the devastation of Hiroshima and Nagasaki. With catastrophic climate change and the current conflict in Ukraine, the Last Midnight looms. 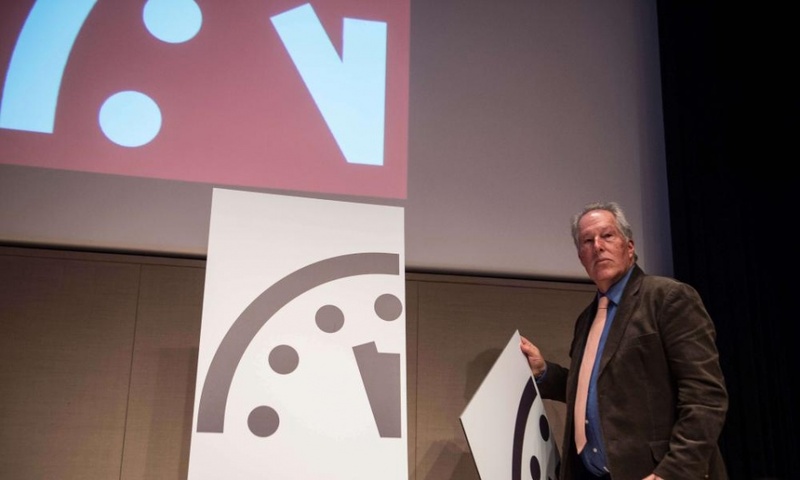 A ray of hope penetrates the gloom, if you close one eye and squint slightly: the Doomsday Clock was designed by Martyl Langdorf, an artist married to one of the remorseful physicists of the Manhattan Project–a sort of conjugal alliance of art and science. Martyl (her professional name) lived to be 96. In her spirited oral history at the Chicago Art Institute, she comments tartly on the ineptness and waste of the so-called intelligence community’s awkward efforts to keep track of her lengthy career as a left-leaning artist. Here empathy served me. Having friends in Eastern Europe and a Berkeley zip code, I found my phone tapped primitively, as in an old Czech movie. Communism, I hope that I can now safely observe, lacks monitory images of spiritual apocalypse. 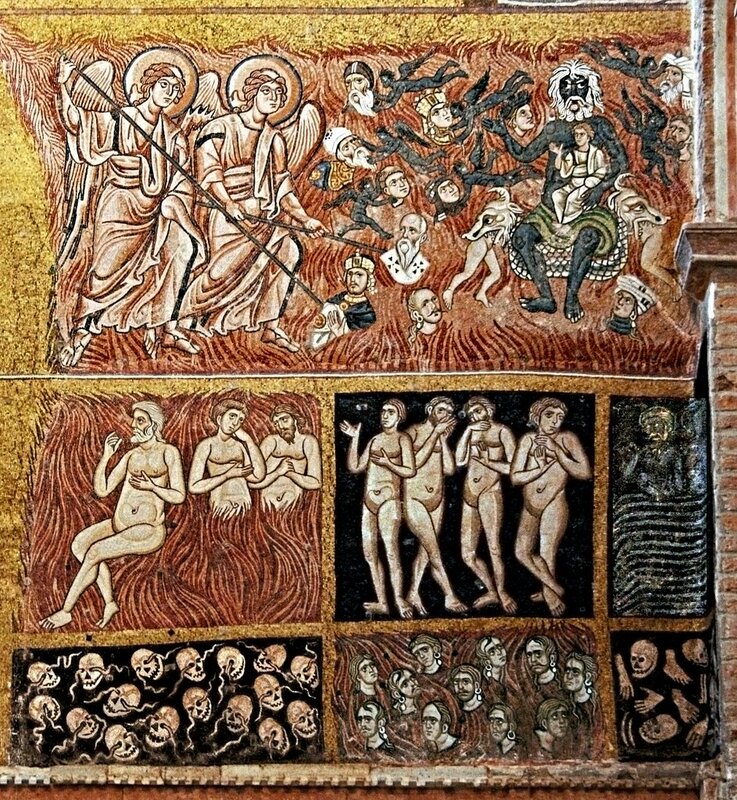 The three Abrahamic religions, Judaism, Christianity, and Islam, feature a Last Judgement at the end of the world. In Islam, the road to salvation is rocky unless one dies in a holy war. In Christianity and Judaism, sinners have at least a fighting chance, so to speak, at redemption. Estimating the numbers slaughtered through the ages in the service of these three great monotheistic faiths is truly daunting. Not to mention the butcheries among their competing subgroups…Catholics versus Protestants, Protestants versus other Protestants, Shi’ia versus Sunni… Historians are inclined to give the most numbers to the Christians, especially if the count includes the Second World War and the Holocaust. But the Apocalypse does play well. 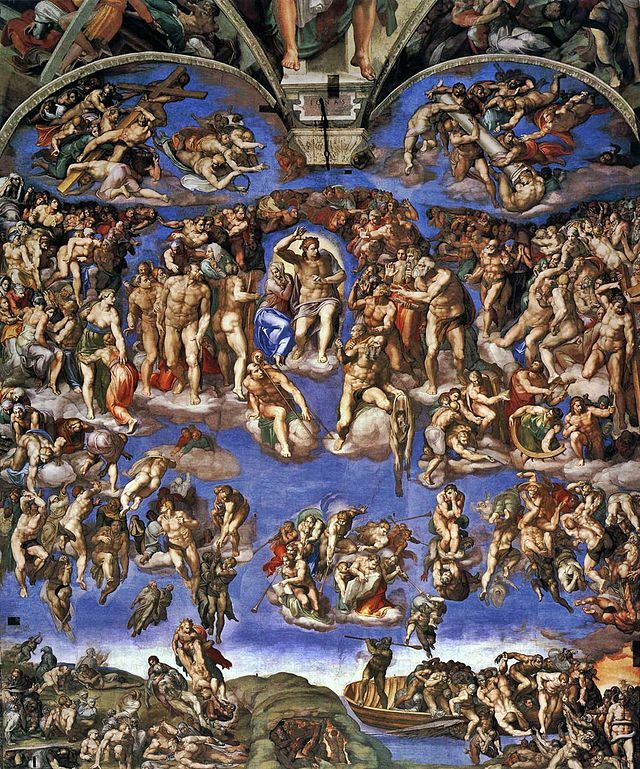 The Catholic Church in its wisdom programs illustrations of The Last Judgement for the exit walls of churches and chapels. In the basilica on the island of Torcello in the Venetian lagoon is a transfixing twelfth-century mosaic. 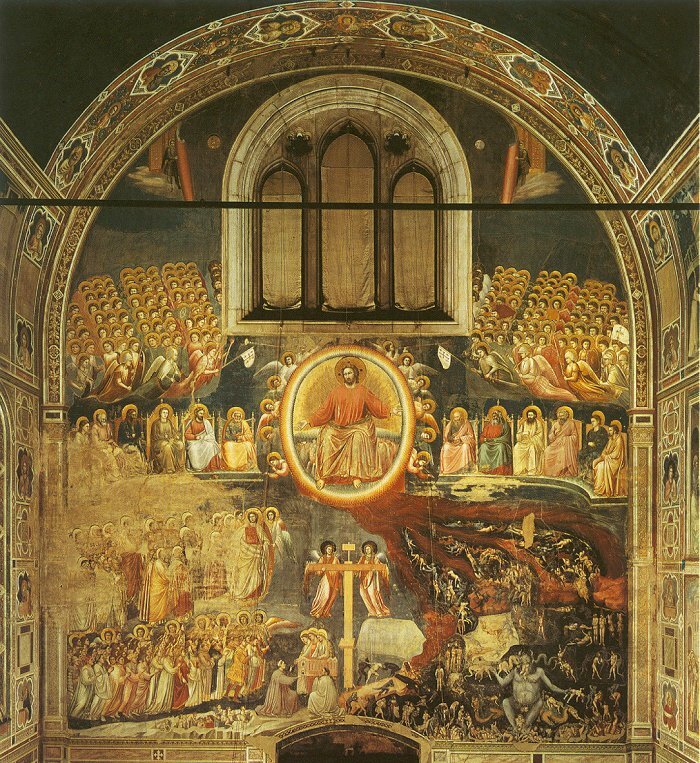 In neighboring Padua, Giotto was hired for a large sum to create a magnificent Last Judgement that would better position the Scrovegni family of usurers (bankers) for possible salvation, despite Dante’s condemnation. Interesting that Giotto himself was said to have exacted an outrageous fee for use of his looms by poor Florentine weavers. A mere two centuries later came Michelangelo’s version in the Sistine Chapel. A Resurrection scene had first been proposed for this wall, but it seemed to Paul III in 1530 that the times demanded a stronger statement. In the 1990s a major restoration effort transformed the Sistine Chapel. At one point I was lucky enough to find myself on the scaffolding watching workers uncovering the vivid colors under the grime of centuries of candle smoke. I saw a master restorer swabbing at the wall with one hand, the other holding a smoking cigarette. Alas, no photo is available. Armageddon also echoes in music. In 1984, as the atomic scientists’ clock was closing in on midnight, Stephen Sondheim was shaping our high anxiety and fear of doomsday into the angry giantess of “Into the Woods.” The musical opened in 1986 in San Diego, not on Broadway. 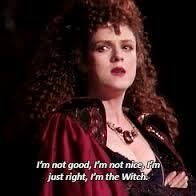 Bernadette Peters’ thrilling announcement of “The Last Midnight” came later. Is it significant that a scientist also presented the 2015 Doomsday Clock there in San Diego, where the catastrophic California drought is still hovering? I suppose not. 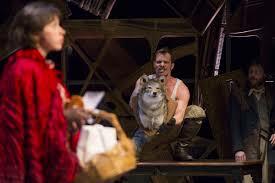 “Into the Woods” has recently, like “Porgy and Bess”, slipped into the opera category. Almost thirty years after its premiere, “Into the Woods” has a lovely revival in Manhattan by a small repertory group, the Fiasco Theater, some Brown MFAs who got together to do what they wanted to do. A full scale nuclear-powered opera, “Dr. Atomic” premiered in San Francisco, California in 2005, with the collaboration of John Adams and Peter Sellars– and Robert Oppenheimer and Edward Teller as the troubled scientists. Probably there is a category for apocalyptic musical works? Faust, Don Giovanni, the Ring, for starters. Surely someone is working on an opera about Edward Snowden, and maybe his proud mother as well. 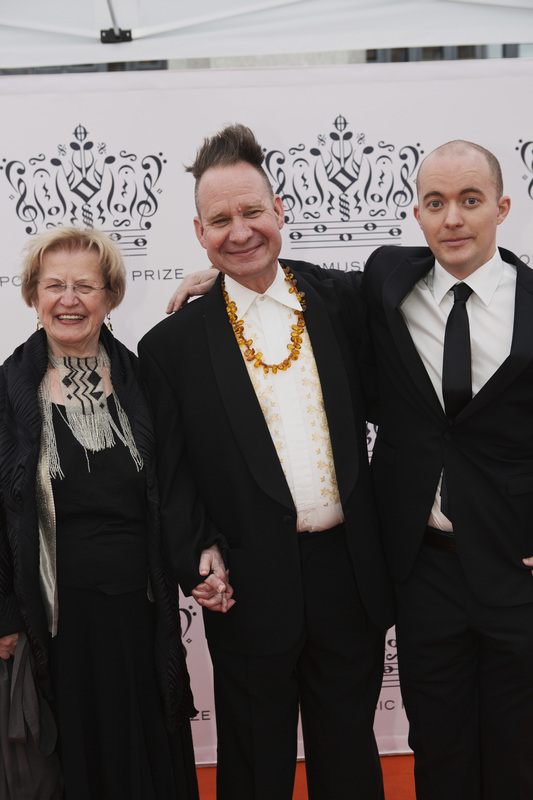 Peter Sellars also has a lovely, proud mother. In the Qur’an, Allah asks Jesus whether or not he claimed that he and his mother were two gods besides Allah, to which Jesus replies that he would never have said such a thing (5:115-117). Emphasis on the “said”. In any event, we mustn’t forget the Rapture, still to come, last trumpeted for May of 2011. At some future time, not too distant, at the Second Coming of Jesus Christ, believers will be raised from the earth to meet Him in midair. However, some believe that a select group will remain behind on earth for an extended tribulation period that might be confused—by me at least—with Purgatory. But Roman Catholics, Orthodox Christians, Lutherans, and Reformed Christians view the Rapture as an all-inclusive final resurrection, when Christ returns–and does not leave us slackers and skeptics behind.